But anyways, here I am, always overloaded with fresh juicy strawberries almost every week. 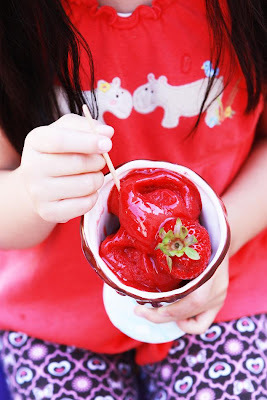 Ever since we went strawberry picking last time, I kept thinking of how to make the best out of the strawberry season this year, and that's when I started writing my list of things to make this summer. At least now I can be glad and proud that I can cross two out of a hundred items (and still growing) on that list. Started out with strawberry shortcake. If you notice, I make strawberry shortcake every year at the peak of strawberry season. 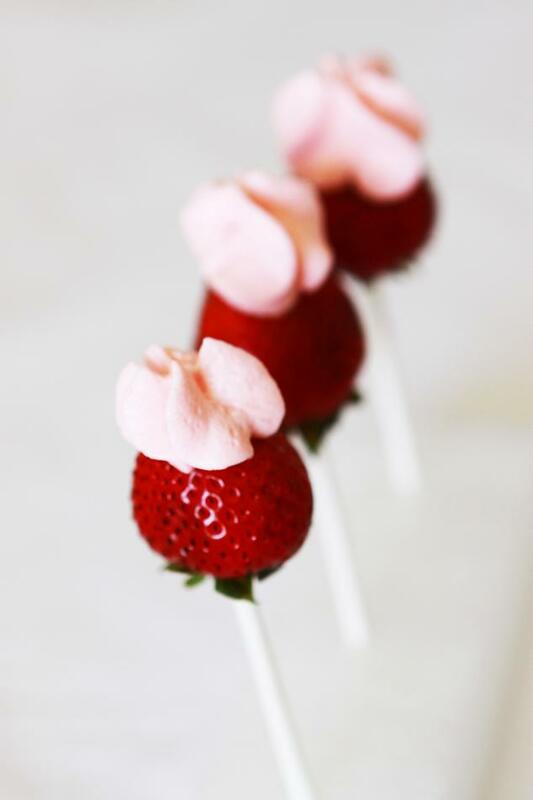 I think this is one of the best ways to highlight the sweet strawberries at its finest. I'm not talking about the all-American strawberry shortcake which is made with flaky scones, but I'm talking what most people referred to the Japanese-style strawberry shortcake, which uses soft genoise or sponge cake instead of scone. Strawberry plays one of the most important role in this dessert, and that it has to be sweet. There's nothing more horrifying that eating strawberry cake with sour strawberries. 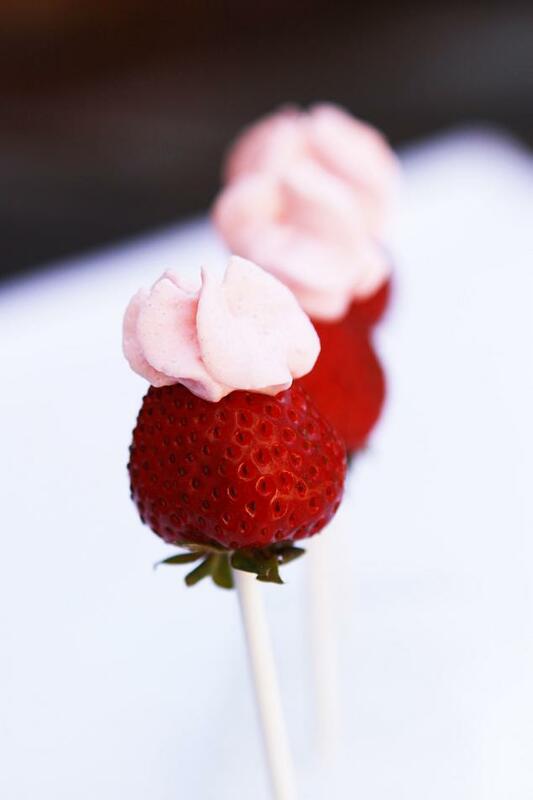 I like to use orange liqueur such as Cointreau or Grand Marnier with my strawberry shortcake as I love the combination of strawberry and slight orange taste in the background. Many people use Kirsch as well, but I am not particularly a fan of it, it's all a matter of taste. Before I'm moving on the sorbet subject, I have a confession to make. I own some cookbooks (or dessert books), not so many, but there a couple of them (I should take a picture of them sometimes), but I rarely or almost never followed any recipe from them. I don't know, I've always been put off in trying one of their recipes because I'm afraid that I won't like them or the recipe is just too lengthy. Most of the cookbooks that I own (or all of them) are the kinds that have a very long recipes page with multiple different components, a lot of them has some bizarre ingredients that I've never heard before or the ones that would cost me a fortune. If I have to choose between ice cream or sorbet on a hot summer day, I would probably opt for sorbet. I don't eat frozen stuff that often (I have very sensitive teeth), but when I do, it has to be good. 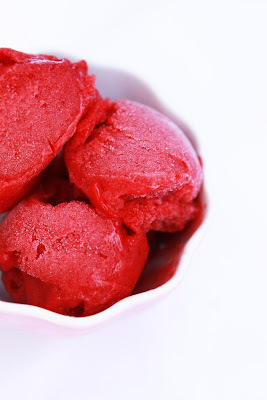 Sorbet is also one of the best ways to bring out the best flavor of the fragrance of the fruit, so simple and so pure. When I was looking for a sorbet recipe, I have a few recipes I can try with very similar ingredients from French magazine and from one of my cookbooks, but I finally settle on the later, which is from this book. 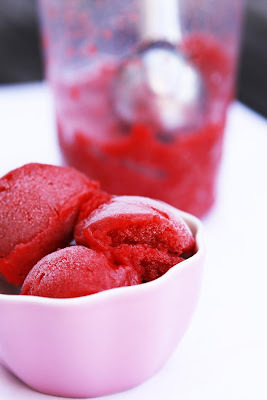 The picture of the sorbet looks so smooth and has a great texture, but it has some unfamiliar ingredients such as atomized glucose and sorbet stabilizer. This is one of my favorite books together with this and this. The book explains what each ingredient is and what their role is in the sorbet, love it! Luckily, one of my favorite baking sites carries it! I had to order it twice because I missed one ingredient the first time, but now that I got them, I'm all set to go. So, what's up with the strawberry lollipops? Umm... nothing really. I just thought that they look so cute on a stick :), don't they? Divide the batter between two prepared pans and bake it for about 20 minutes or until done. To assemble: Put one layer of cake on a base and spread the filling on top. 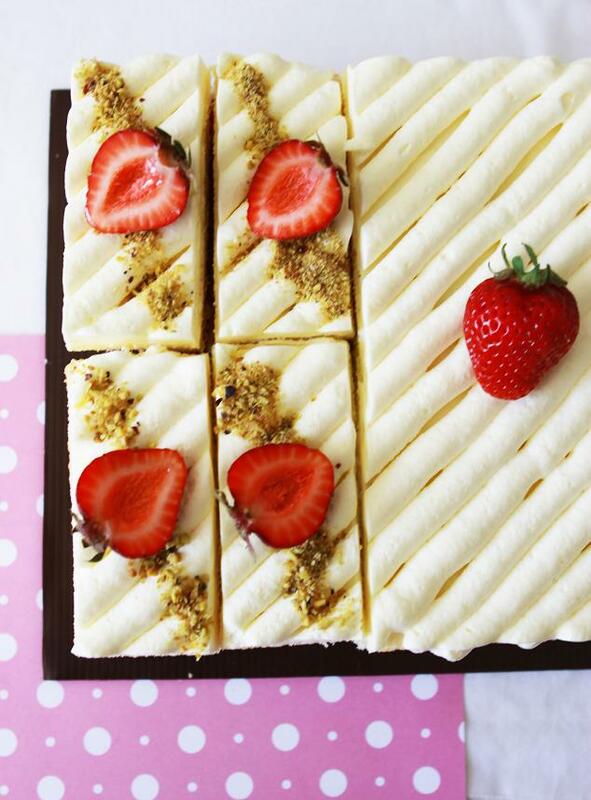 Arrange the strawberry slices and top it with the other cake. If you don't have enough filling for the top layer or to decorate it with, just simply whip fresh whipped cream with a little sugar (you can add liqueur if you want). Put the water and atomized glucose in a sacepan and bring it to a gentle boil. Mix the sugar and the sorbet stabilizer, and add it to the water mixture and bring it back to a boil. 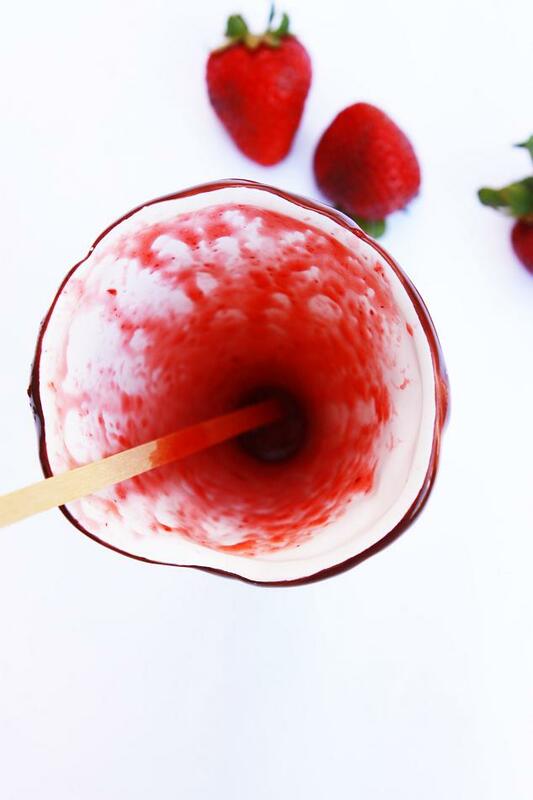 The book says to mix everything (except the strawberry puree) without boiling them first. I boiled mine to dissolved the sugar. The book also suggests another alternative, which is to boil all ingredients to a certain temperature, and cool it for 24 hrs before churning. The mixture needs to sit for a long time to let the stabilizer develop its role, but I also read a few other recipes (not from the book) which only matures the sugar syrup overnight and churn it immediately after being mixed with the puree. Some doesn't even require maturing, just mix and churn. I am so sad strawberry season is over here... I used to stock up on them, too! The sorbet really looks good. I didn't know what was atomized glucose and googled, ah-ha! It's powdered glucose. It's a pretty common ingredient then. BTW, if I omit the sorbet stabilizer, will it be ok, I don't think I can find that here. Everything looks so beautiful and colorful. I really like how you iced the cake too, so pretty. This looks beyond great!! So professional looking and your pictures are great!! 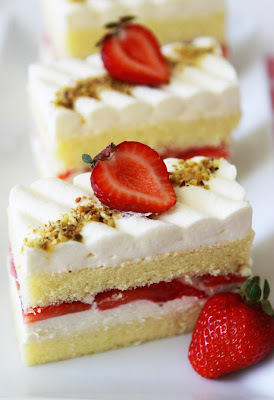 I love strawberry shortcake but I love it with a cake, not a scone, like this one!! Avanika: It's really easy to pipe the top that I don't think tutorial is needed :). I simply pipe some cream using round plain tip with approx 1cm diameter diagonally. I've got 2 awards for you, please feel free to get it from my blog. Beautiful photos :) I don't know why I haven't found your blog before this, but I'll be sure to drop by more often! Very impressive. The diagonal piping really makes it over the top! In a good way. Great work. 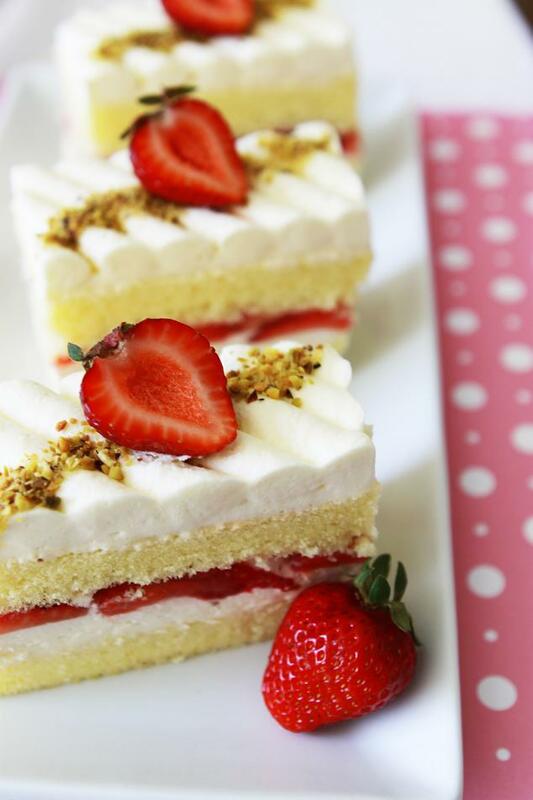 Hi there,this cake looks so nice.. 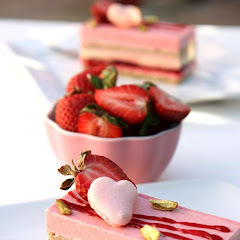 I was trying to bake this yesterday for my cousin sister,she is one of the strawberry lover! just wondering is it actually taste like this? the cake shouldn't be dry as it uses quite a bit of butter and more fat from the yolk. I don't know why yours is dry, I can only guess that your oven temperature is hotter than mine? or did you bake it longer? did you use smaller pan size? Hey Your cake looks really awesome~ i'm bought to bake one tomorrow for a friend would just like to ask if you're using large or medium eggs and whether i can sub the pan wit an 8 inch round pan? Teoh: round pan has smaller surface area than square one, so your cake would be higher, which is fine if you're ok with it. 8" square is similar to 9" round, so you could use that too, or just convert the recipe from 8" sq to 8" round by multiplying everything to 0.8 (I just did the conversion :D). I always use large eggs, or extra-large eggs sometimes. 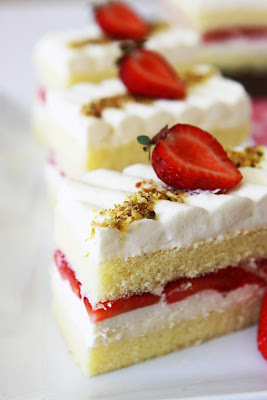 Hi...This strawberry shortcake looks amazing and am in the middle of attempting to make one. How long do you beat the eggs and sugar for before it comes to the ribbon stage. I've been beating mine for 5 minutes but that just seems like a little too long for me. Do you use a wisk or the paddle attachment? Thank you! 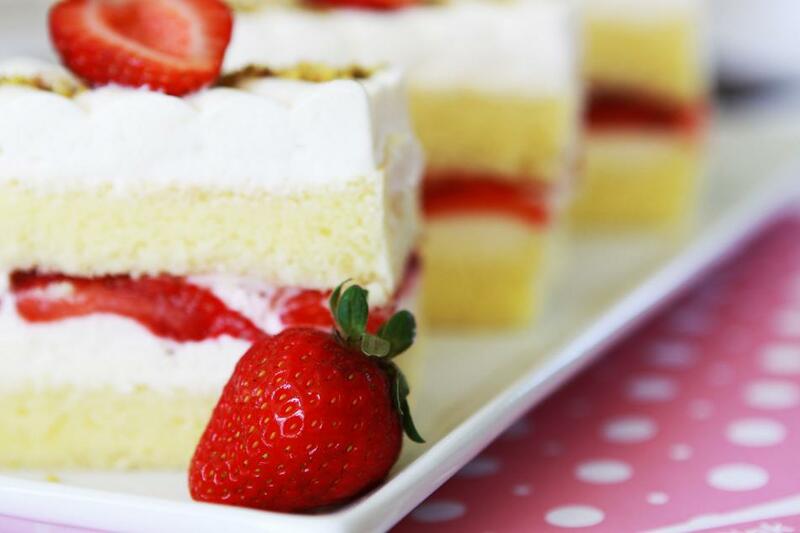 Hi, love the picture of your strawberry cake! it looks amazing. i just tried making it, added some gelatin into the cream. However, it did not come out as smooth as Id have liked it to. Is it cuz I overbeat the cream? How do I get nice diagonal patterns on the cream like you did? This looks awesome, I just saw in this post what books you have as a reference. 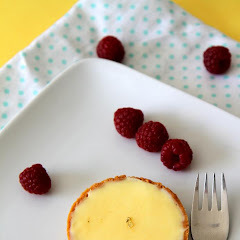 I asked you in the lemon tarts blog about the books. I definitely want the Alain Ducasse book but will have to wait for my birthday (which is coming soon, November ;). ) or for Christmas. The Pierre Hermes book looks awesome too. Will check it out. I baked sponge cake in two eight inch square pans but cake did not rise. It's about half the height of cake in your photos. What did I do wrong? Anonymous: It is difficult for me to say what went wrong without actually knowing how you did it or how the end result looks like. When the cake doesn't rise, there a couple of things that could go wrong. You might loose a lot of air from the eggs when folding in the flour and butter so the batter deflate. Another reason might be because the melted butter is not folded properly and would sink in the bottom of the cake when baked. What are the crushed nuts on the Strawberry shortcake? IS that crushed Pistachios? Hi, I was wondering how many grams of Cointreau did you use in the filling mixture. Also, I do not have a weighing scale to measure into grams, is there any way you could make the recipe into cups measurement. Thank you. Anonymous: I didn't measure the amount of Cointreau, I just put enough until it tasted right for me. don't put too much at first. As for the measurement, I'm sorry, I don't have the recipe in cup measurement but you can google it to find out the conversion. I just stumbled on to your blog...Wow, I am so impressed with all your cakes:). 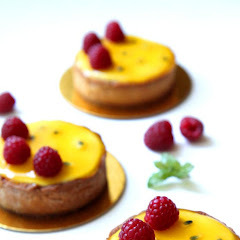 You should become a pastry chef with your talent! I noticed you have 2 different recipes for your strawberry short cake. Which do you prefer? One has more yolks added, and the other just use the yolks and whites separately. Which is softer? In your opinion, which is better in flavor and texture? I would like to make one for my husband this weekend. Thank you! the one where the white and the yolk are separated is the chiffon method, this is definitely softer. But in terms of which one is better, it is really a matter of taste. Bao Kim: I always use Pierre Herme's recipe for making macarons. It is more involved and in my opinion a bit temperamental in terms of getting the feet, but it is more stable. whereas the French meringue method, it is easier and I've gotten much success rate making it, but it is more fragile. Oh one note on the sponge cake, I would add more butter next time to make it more moist, maybe about 80g instead of 60g. This cake looks amazing! 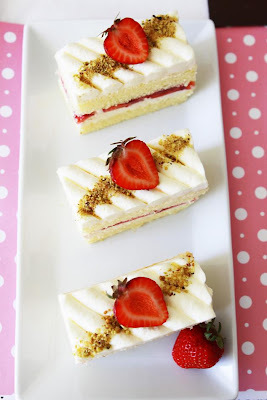 Would this strawberry shortcake hold up well for a stacked wedding cake? We do not want it to look like strawberry shortcake on the outside. Also, what would you suggest as a non alcoholic substitution for the liqueur? Curious: I wouldn't recommend it for wedding cake as it contains whipped cream, which gets soft without refrigeration. The way I see people do strawberry shortcake as a wedding cake is using non-dairy whipped cream. I heard they can withstand heat up to 90F (non-direct sunlight), and use buttercream on the outside to be safe.